Our Lady of Mount Carmel School continues a long and storied history of educating young men and women in Eastern Baltimore County. Dating back to 1893, long before the streets were paved, Our Lady of Mount Carmel was a tiny mission parish made up of industrious farmers who were dedicated to their faith and had a deep love for their church. As the growing population of the Mount Carmel Community continued, so did the warranting of an educational facility to properly instill faith and fundamentals in their youth. As planned by Father Nicholas M. Jaselli, OLMC Pastor from 1916-1949, school construction began in the summer of 1925. 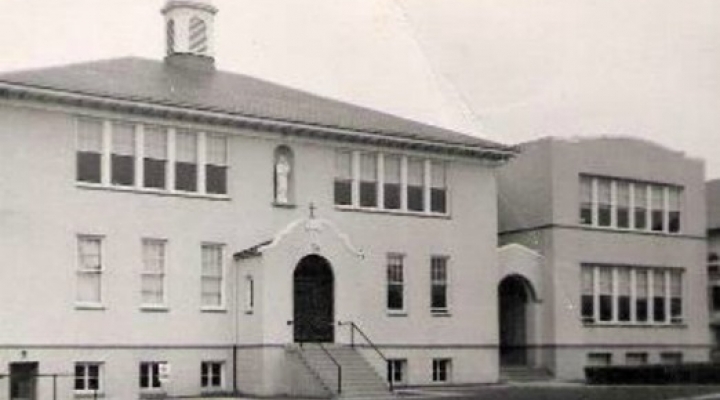 Founded in 1927, with a four room elementary school, 187 pupils began their education on the Mount Carmel Campus. In 1929, with the help of booming local industry, the Essex-Middle River area saw incredible growth which brought more and more families to the little town. By 1935 the school had over 360 students enrolled, causing the need for additional classrooms. In 1949, Father Jaselli was replaced by Rev. C. Carroll Kerr, who during his tenure saw enrollment reach 850 students and the addition of five new classrooms to the preexisting school structure. Elevated to Monsignor in May of 1958, it was Msgr. Kerr's dream to provide his parish students with the opportunity to further their education through high school. 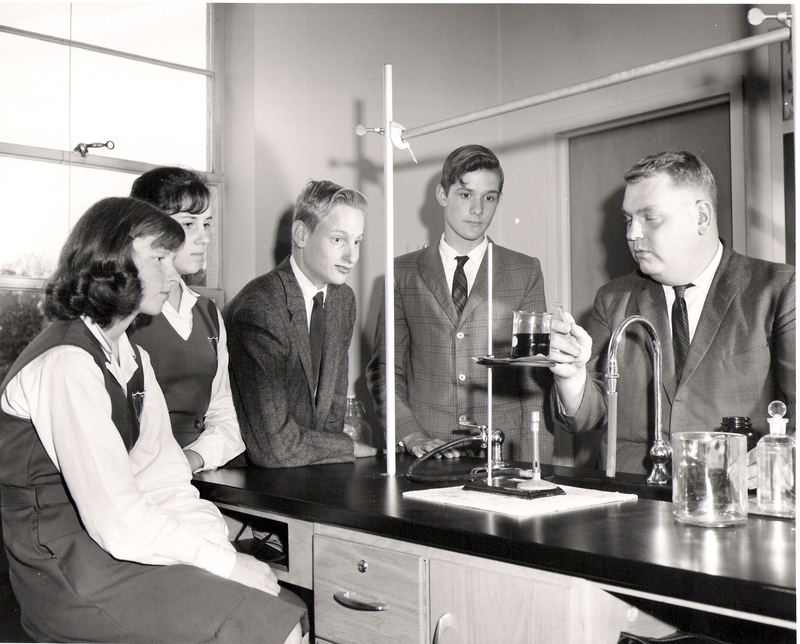 The wheels of the high school concept were already in motion in August of 1958 when Msgr. Kerr suffered a severe heart attack. Unfortunately, in January of 1959, Msgr. Kerr passed away before seeing his dream of a high school come to fruition. 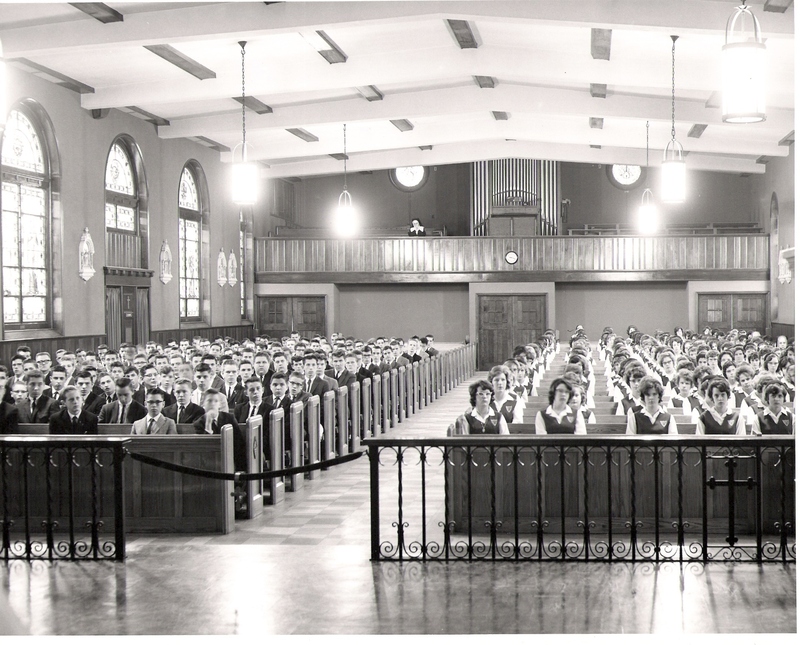 In September of 1959, Mount Carmel High School was completed and opened its doors to 87 students. A few years later, the 70s, the Mount Carmel Campus was busy and buzzing throughout the area. The high school library was moved to the first floor beneath the gymnasium and a biology lab-classroom was added. Exterior changes also took place as the church parking lot was shortened for the installation of an athletic field for physical education classes and athletic team use. The elementary school was also able to celebrate 50 years of service to the community in 1977. The school mascot, the Cougar, was introduced in 1971, appearing at athletic contests and events to cheer teams to victory. Cougar Fever spread throughout the area with the help of the school's athletic van, used to transport athletes, bearing the warning "BEWARE, COUGARS INSIDE!" In 1978, Father Don McMasters came to Mount Carmel. Father McMasters was an ardent advocate and guide for young men and women, soon becoming a beloved figure on campus. His untimely death in April of 1979 marked a period of grieving as students and faculty mourned the loss of their mentor and dear friend. Years later, both the endowment scholarship fund and the Honors Program were named in his honor. Through administration change, Mrs. Kathleen Sipes became principal of the elementary and high school in January of 1991. Through her leadership, the school developed and adapted its curriculum to attract and challenge gifted, college-bound students. The English and Mathematics Departments were formally added to the McMasters Program, as well as the developing of strategic plans for the use of technology on campus. In the fall of 1996, Reverend Doctor Robert Hartnett joined the parish as pastor, immediately taking an active role in the elementary and high school. The now Monsignor Hartnett, even took part in the Men's Soccer Team's MIAA Championship run in 2000, as he along with the players dyed his hair blond in support of the eventual champion Cougars. After the turn of the century, the Archdiocese of Baltimore made many changes to the organization of the Catholic schools in the Baltimore area. In 2010, Mount Carmel reorganized its school structure which would incorporate Upper (6th-12th grades) and Lower (K-5th grades) Schools to its campus. Mrs. Kathleen Sipes would also take on a new role, becoming the first School President in Our Lady of Mount Carmel history. Looking to today, so much has changed in Mount Carmel's history. Under the recent leadership of Lawrence Callahan as president, the school has launch a $3,000,000 Capital Campaign.